It’s a Hoax: IE Users Have a Lower IQ! Four days after publishing this article, the AptiQuant survey was reported to be an elaborate hoax. The company and site appeared on the web within the past few weeks and seems to have taken staff photos from a legitimate research company. The 2011 assessment sampled 101,326 individuals over the age of 16 from the US, Canada, UK, Australia and New Zealand. The company offered a free IQ test which most participants found via organic search results or PPC advertising campaigns. Subjects were not aware their browser preference was being monitored. IE users had a significantly lower IQ. There was little difference in the IQ for Firefox, Chrome and Safari users. 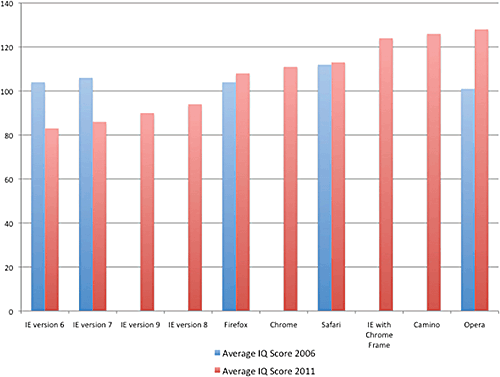 Individuals using Opera, Camino, and IE with Chrome Frame had the highest average IQ. Comparing the results to a 2006 survey, the report suggests that people with higher IQs have moved away from Internet Explorer during the past five years. Those at the lower end of the IQ scale tend to resist change and browser upgrades (and possibly upgrading any software). The results are not surprising. Those with lower levels of IT literacy do not know what a browser is and will simply use whatever application is installed on their PC. In most cases, that will be Internet Explorer. Similarly, power users and developers will investigate different options and actively keep their software up-to-date. It’s logical that Opera — a lesser-known browser with a steeper learning curve — attracts users with a higher IQ. It will be interesting to see whether this simple survey has a greater effect than all the “abolish IE6” marketing campaigns. Let’s hope so. Obviously, you’ll want to view those links in Opera!